When trying to improve the quality of your diet, you can’t go wrong eating fruits. They are rich in essential nutrients, and making them a regular part of your diet may help lower your risk of heart disease and cancer. Figs and dates are no exception. While both are a good source of a number of nutrients you need for health and wellness, dried figs may be a slightly better choice if you’re looking to maximize the nutrition of every bite. • Add flour, salt, oil in a bowl and make it to soft dough of chapatti consistency by adding little warm water at a time. Then wrap it with the cling film or a kitchen towel and rest for 20-30minutes. • After 30minutes knead the dough again for 2 -3 mins by adding some oil –the dough becomes soft and pliable and keep it aside for another 20-30minutes..
• Meanwhile finely chop Dates and Figs and blend it to the smooth paste and add sugar/ sweetner and blend without adding any water. • In a pan dry roast flaxseed and as it cool down grind it to the smooth powder and set aside. • Now heat milk/evaporated milk in the pan and add the powdered flaxseed and ground paste and keep stirring on a medium heat for around 5-7minutes. Make sure to stir on a medium flame so that the stuffing doesn’t stick to the pan. • Mix cardamom and nutmeg powder and switch off the flame. • Make golf sized balls of dough and the date-figs stuffing as well. • Grease a parchment paper / thick plastic wrap with little oil and place the dough ball in centre, press the dough with your fingers and start spreading it to the circle starting from center, working towards the edge. Make poori sized circle about 3 inch diameter and place the dates-figs stuffing ball at the centre. Close the stuffing by pulling the dough on all sides. • Slowly press the dough with your fingers to about 1/2cm thick and 6 inch diameter. Use little oil/ ghee if the dough sticks to your fingers. • Heat griddle/tawa and gently transfer the parathas to the tawa and cook on both sides by applying little oil till golden brown patches appear and until they are cooked well. • The stuffing can be done only with dates. • For the tastier option add ghee while frying the parathas. 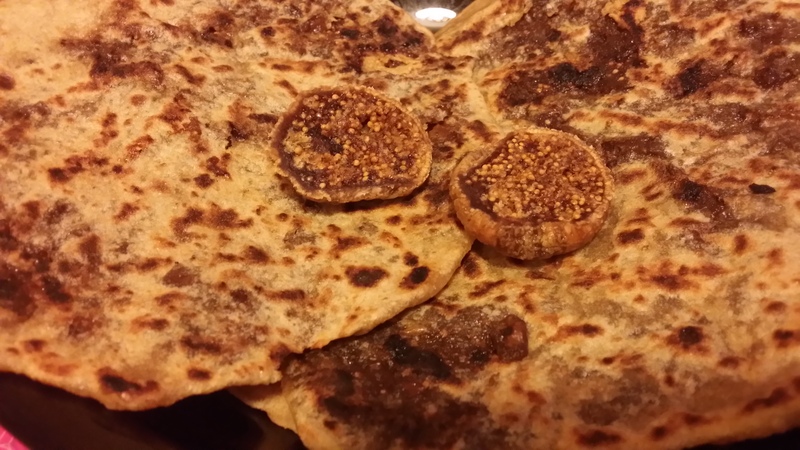 • This stuffed flat bread/paratha is traditional called as Obbattu/Holige in South India. • If you find difficult to spread the stuffed dough then place another greased sheet of plastic/parchment on top of the dough and roll it gently. • Can enjoy the stuffing alone as a roll by adding some nuts and cutting into small pieces. Posted on April 13, 2014, in Indian, Sweets and tagged dates, drchdietfood, figs, Stuffed figs & dates. Bookmark the permalink. Leave a comment.